Kellogg's created liquid nitrogen Froot Loops cheesecake bites, Cocoa Krispies cocktails and Special K falafel sliders to mark National Cereal Day in the US. 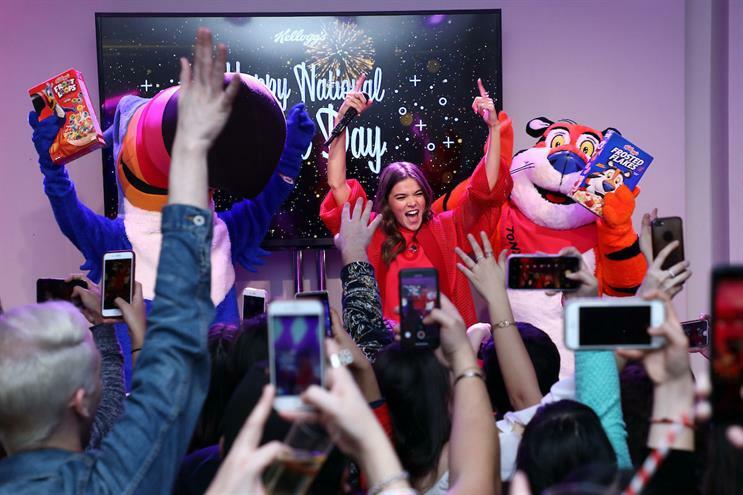 The brand hosted a party last night with a performance by Hailee Steinfeld at the Kellogg’s New York Café which included a countdown to midnight. There was also music from DJ Flipside, large cereal boxes suspended from the ceiling, a photo booth with cereal-themed party favouors, colourful confetti and a "giant disco bowl" that lit up at midnight. Those who didn’t make it to the party can try out the new recipes at the café today. Aleta Chase, Kellogg's marketing director, said: "Kellogg's NYC Café continues to spark creativity by encouraging people to reimagine what a bowl of cereal can be – and even the bowl is optional. It made sense to celebrate this modern, inventive approach to how we think of food on National Cereal Day."